According to Business Insider, it’s the second most sought-after commodity in the world. It’s worth $100 billion. But as lucrative as the coffee business is, it’s not an especially stable one. If Wize Monkey has anything to do with it, that could soon be a thing of the past. Wize Monkey makes tea out of coffee leaves. It’s an unconventional business, so it’s fitting that it started in an unconventional way. When they were students at the KEDGE business school in France, Wize Monkey co-founders Arnaud Petitvallet and Max Rivest learned about a study that showed that coffee leaves had a surprisingly high antioxidant content. Neither had ever heard anything about coffee leaves before, but pretty soon, they learned everything there was to know. They realized that by finding a way to utilize the coffee leaves they might make the coffee industry a little more stable. As they began to research, they discovered that drinking coffee leaf tea wasn’t new. People had been doing it for hundreds of years, but nobody had ever put a concerted effort into making a real business from them. Armed with this knowledge and brand new business degrees, the pair hopped on a plane to Nicaragua. There, they started working with coffee farmers, spending three years borrowing techniques from traditional tea processing and trying all kinds of experiments to make a product they could be proud of. They also met third-generation fair trade coffee farmer Enrique Ferrufino. Enrique loved the idea of using coffee leaves to make his business more productive year-round, and Arnaud and Max loved his thoughtfully designed farm. Enrique became Wize Monkey’s third founder, and the business grew from there. 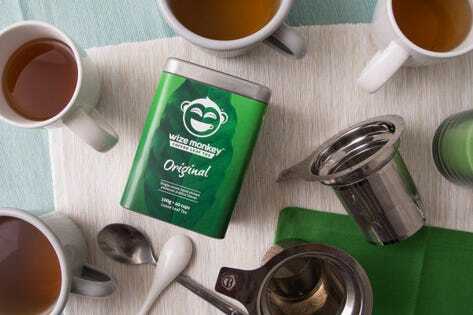 Wize Monkey’s tea is mild in flavor, can steep seemingly forever without getting bitter (the package claims that you can steep as many as three cups from a single “sachet”), and has a caffeine level that resembles that of green tea. While people who have a strong preference for coffee or tea might not change their habits any time soon, Wize Monkey’s product provides a tasty (if relatively expensive) new way to get your caffeine fix. If the company keeps growing and tinkering with its recipe, Wize Monkey could make a very real impact on a multi-million dollar industry.